As a NYC resident with an intense and unpredictable office job, I spend a lot on restaurants, both for eating out and for delivery. I'm still trying to hash out what my monthly food budget should reasonably look like, but one way that I try to keep costs under control is to stick with a rotation of tried and true modestly priced (for NYC) restaurants as much as possible. The criteria for this list is as follows: (1) these are sit-down restaurants that are (2) reasonably easy to get a table at for a group of two to four, with a wait of up to 30 minutes or so on a busier day at the no-reservations places (which sometimes requires going at slightly off-peak times). Each of these restaurants is (3) delicious, in my opinion, and (4) has at least a few items on their menu that could be an entree or be combined into a decent-sized entree that maxes out at around $16 before tax and tip, which should leave the cost of your meal right around $20, give or take a dollar. I do, by the way, consider it extremely important to tip well, especially when I'm ordering something on the cheaper side. Tips of at least 20%, often slightly more, of the pre-tax price are standard in NYC. Although there can be times when service does not match a 20% tip, I find that most restaurants here consistently meet a high standard for both food and service. Any problems I've had with restaurant service are often issues with management rather than the fault of individual servers, so I've never had occasion to even think about tipping less for quality-of-service reasons. A few notes. This list is a bit heavy on non-Western cuisine, largely because it can be difficult to find western restaurants that fit my price criteria, are delicious in a standout way, offer especially good value for money, and on top of that, are also reasonably easy to get a table at without a crazy wait. With Asian places though, the entree that meets my price criteria is often a plate of noodles or requires splitting some noodles or rice and an entree family-style with a dining companion. Important Notes: Requires waiting in a line outside the restaurant. This is my favorite weekend brunch place on the Upper West Side though, I must admit, part of how it got on the list was that it has a reasonable wait, unlike so many other places. Their brunch choices are very competitively priced, and I think you could add on a coffee and still get in and out for $20 or slightly less. Important Notes: Both locations I've been too are small, so sometimes the wait can get longer. Avoid peak times. They are most well-known for making a bunch of veggie-based "market sides," but I've often stuck with their well-priced and decently-sized salads. All their locations are very popular and a little small, so it can get very busy. Important Notes: Brunch wait times get heinously long, avoid peak brunch hours. Because many of their branches are located in areas that don't have a lot of competition for brunch, the wait times can get very heinous at those hours, though it's generally been quieter during other meals. They have a solid menu with a decent amount of variety. Important Notes: Waits could get long for groups of three or more due to the way their tables are laid out. My favorite Vietnamese restaurant in the city, and I'm quite picky. Admittedly, I'm no expert on Vietnamese food, as I mainly order pho and banh mi, but I do know a good pho when I see one Although the restaurant is a little on the small side, tables turn over very quickly. K and I always end up here by initially wanting to go to the Chinatown Joe Shanghai, finding that the line there is still too long, and then opting for Shanghai Cafe because they do very good soup dumplings on top of a diverse menu. I've had both Joe Shanghai in Midtown and Nan Xiang Dumpling House and, honestly, Shanghai Cafe's soup dumplings are better than the ones at the midtown Joe's and hold their own with Nan Xiang's. Important Notes: Make reservations for weekend dinners. Sometimes when something isn't available on Opentable, you can still get it by calling. My favorite sushi place, with good sushi and, perhaps more importantly for something to become a favorite for me, competitive pricing. I love the ankimo appetizer (monkfish liver) and often get that on top of a two rolls, which might slightly exceed $20 all in. Meeting my price criteria might require piecing together your meal from an order of two to three rolls, which I find plenty filling. Important Notes: Best to make a reservation for weekend dinners at the Hells Kitchen location. There are so many delicious and reasonably priced Thai places in NYC that they could easily dominate this list. I also enjoy Zabb Elee and Ngam in the East Village. Important Notes: Can get busy on the weekends, but tables turn over quickly. BCD specializes in soondobu jigae, a Korean tofu stew. The photo above is a combo meal that is available for weekday lunches and after 10 PM. 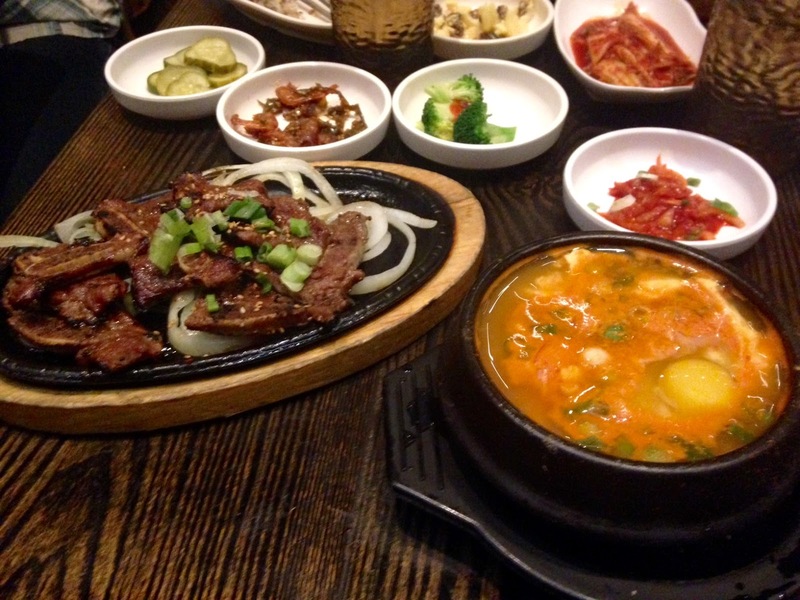 It is a fabulous deal, around $19 before tax and tip for a meat dish (I love the LA Galbi) plus a small tofu soup, but that does exceed my price criteria. I typically order just a tofu soup instead ($14 before tax and tip), and with their generous selection of banchan, it is a good-sized meal. The food here is delicious and very affordable. K and I usually stick to the lamb and pork "burgers" because they travel better as takeout. The lamb burgers are rather spicy. Important Notes: Not sure they have much of a sitting area at all. I miss living in Tehuitzingo's delivery radius. There are several reputable taco restaurants that deliver to my current apartment, but none of them remotely compare.